Wow, this has been a hard, hard year for gardening. Last rainy season started out early and promising; October 2013 we got a couple of good rainstorms and then .... nothing. Nothing. More nothing. Which dragged on to the historic drought. Usually my water usage goes down during winter, but not last winter. I had to water the garden areas every week, and the lawns twice a week (one of the reasons I'm xeriscaping) just to keep them alive. I took special pains with the two avocados and the camellias because they're the grandparents of the backyard, planted by the previous owners sixty years ago. I soaked them deeply at least once a month. But despite my best efforts, the plants still suffered - not from lack of water, but possibly from high salt buildup or basic soil ... the older avocado and camellia leaves took on a pale bronzy color, and needles on my canary island pines were just beginning to turn yellow. In addition, the tomatoes were crippled and the eggplant killed by a horrible infestation of spider mites. Last year, I gave away almost thirty pounds of homegrown tomatoes and had all of the eggplant I wanted. This year, I was lucky to have enough fresh tomatoes for a weekly salad, and just a few eggplant before they gave up the ghost. The spider mites went on to attack a few more plants (which fortunately I didn't care so much for). My Italian flat beans- which I've never grown before - and my sunflowers (which I HAVE grown before) were spindly and unproductive. Same seed source. I wonder if the seed was good. At least the corn came up OK.
For no reason that I can see except they really, really didn't appreciate such hard wellwater. And then, the summer was hot and humid - tropical, even - and some native plants which are adapted to cool wet winters and hot DRY summers responded with a fantastic case of mildew. I broke down and got some Neem oil so that next year I'll be prepared for the onslaught. I have NEVER failed with so many plants all in one season! This was a gardening year I was happy to close the book on, and I now have a much MUCH greater appreciation for the commercial farmer, who lives or dies by whether plants produce or not. But in order to be a gardener or a farmer, one must be an optimist, I guess. I've been buying my xeriscape plants mostly in onesies and twosies because I really don't know how they'll grow, or what they'll look like ... or what I want ... and the reality is that I'll still have a surprising amount of bare space, even when the plants mature. 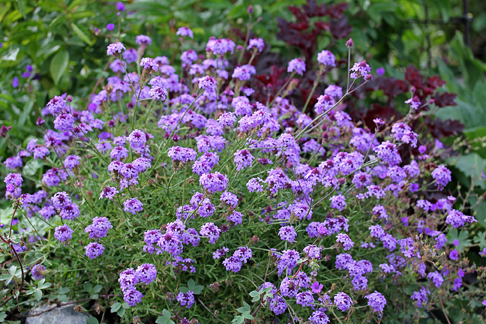 to go with the germander sage, Dusty Miller, red autumn sage, and the creeping Oregon grape and various native currants and snowberries under the trees. I hope, when all is done, that you would feel as if you were in some very nice landscape, something that nature had put together in a happy combination of loveliness. And then we got RAIN!!!! A storm last Sunday dropped an unexpected 1/2 inch of rain on our location, and the storm which followed added another inch. I once again found myself wishing I had a rain barrel or two or seven. The plants already look happier for the soft water. So there it is for the garden so far this year. A horrible horrible season, but maybe things will turn around this rainy season year and we'll get at least the usual amount. I still plan to xeriscape more lawn, it just takes a surprising amount of plants to fill in the spaces, I'm finding out! I hope you enjoyed the pictures. One of these days -when the plants mature - I'll take real photos of my real garden and post them online. Why, thanks RAPPY. I know gardening isn't your thing, but I appreciate the kinds words. You can't build a nation with bombs. You can't create a society with guns. But maybe you can grow one with plants! So are things flowering at this time of year in your part of the world? Summer has just started here, so a lot of the spring flowers have finished and we are not onto the summer blooms. The blooms on the hydrangea is almost ready to colour. Pity my husband hates these, otherwise I'd plant a few more. It's a cool and rainy start to summer. Okay by me. Anything to prolongue the start of the fire season. I'd have made a poor hobbit, but I do appreciate the green growing things. these plants grow amazingly in this area. It's a cool temperate region, officially. High rainfall, cool winters, warm to hot summers. I do feed them, but they almost grow wild. I was going though a heavily wooded area in Pennsylvania years ago. The snow had melted but the trees hadn't leafed out yet. It was dreary, dreary, dreary. And in a clearing was a bright pink azalea in full bloom. I had never seen anything growing wild that was that bright and fancy - to my mind almost gaudy - until then, and haven't since. I had had the idea that wild flowers were small ... and inconspicuous ... and plain, and that they didn't become extravagant until the hybridists got their hands on them. That azalea made me realize that nature can put on quite a show, all by herself. Our weatherguessers are saying all our snow will melt in the coming days. Is your garden getting drowned or blown away? How fragile are the plants you referred to? MORE RAIN IN THE FORECAST! MORE RAIN! MORE RAIN! MORE RAIN! Oh, who cares about mudslides when we're getting RAIN! Glorious RAIN! GA suffered through a couple of droughts several years ago, and I can understand the happy dance for rain. Fortunately, the rain came in the summer, where it was needed most, and man, it was truly glorious. Screw the umbrella, let it rain , baby! Glad you're finally getting some water, Signy. Enjoy your rain. Some rain in the forecast, maybe. El Nino isn't supposed to kick in until late this month, but the weather is finally FINALLY cooling down. Up until about 3 weeks ago, it was still hitting 100+ during the hot spells. Time to plant more CA natives! This was the first time I've EVER seen a scrub jay here. I've been trying to attract them for quite a while, with peanuts and water, but the only thing I think I ever attracted was squirrels, possums, rats, and raccoons. Yanno, I really missed seeing blue jays, my sis has them (and woodpeckers) all around her house about 40 minutes from here, but we're just not "country" enough. They kind of remind me of my childhood running around in the fields and woods and at daycamp in the summer, so it was a real treat to see one flitting thru the climbing rose bushes. Also, my backyard is now a certified habitat. There is a small parking lot where I park every Farmer's Market day, and it has a lonely tree... I think it's a Bradford Pear ... that I try to park under, for the shade. Some time in late-June, I guess, I noticed the tree was looking really stressed ... some branches had brown leaves, many other leaves on other branches were curling back. I guess nobody was watering it, or the irrigation system was broken or something. So I grabbed my emergency gallon of water and dumped it on the tree, and have come back each weekend with four gallons of water. There I am: a crazy old lady watering a parking-lot tree. I can proudly say that I saved that tree from certain death. 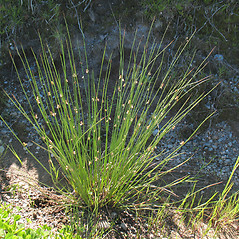 With water, the dieback stopped, some branches had out-of-season bloom, and the bud tips on the branches stayed viable. Until we get some actual RAIN (when IS that El Nino showing up, anyway???) I'm going to keep on watering that tree. and quercus tomentella (Island Oak). It may not be raining, but at least it's gotten cooler, and the plantings are surviving. If I wish for it really hard, and you wish for it really hard, maybe the rain goddess will make it happen? I miss wind and rain. I miss thunderstorms. I'm a transplanted New York upstater who got yanked out of my home state BEFORE I had a chance to get entirely fed up with snow! When I first moved to CA, aside from my initial reaction to looking down at the air basin from the Cajon Pass, at the end of a 10-day smog siege in August while 3 fires were burning, at the setting sun barely glowing thru the smog, surrounded by rocks and dry stubble, and thinking... I'm moving to Mordor ... well ASIDE from that my SECOND reaction was... Doesn't it ever RAIN here??? Well, it looks like El Nino is making a late entrance. Finally! We've been eking out a tenth of an inch here and there. The state, at the latitude of San Francisco to Porterville, is at about average rainfall. The state ABOVE that latitude is above average. Redding, CA (more than halfway to between San Fran and the Oregon border) is at about 1.5X normal. Portland is at 2.5X normal (flooding). Vancouver BC looks a bit more normal. Maybe it will be a rainy spring, and the rain will wash the pollen out of the air??? Let me know how that goes. I too have massive allergies - not sure to what, haven't been tested yet - which stuffs my nose up all year round to the point where I HAVE to use decongestant and steroid spray at night or I can't breathe. Been having fun watching the storm approach, via my favorite website (wunderground.com). It's a great website because it predicts for YOUR ZIP code, not the for the nearest airport. That makes it a lot better for us, since our local tennis courts are inevitably 5-10 degrees F hotter than the airport, and if I'm going to play tennis, I'm NOT going to play in 90 F weather, dang it! Although its great at temperature predictions, it tends to underpredict rain. (On the other hand, radio and TV forecasts tend to overpredict rain, so I guess it's "as good" as anything out there.) I have fun watching the "%chance of rainfall" graph as it approaches the day. The way it's been working, for the past 6 storms or so, is that it start out looking like robust chance of rain (50% over two days) ten days out, but as time goes on the chance of rain goes lower and the duration gets shorter until pfffft - nothing! THIS time, the predicted chance of rain has gone HIGHER, the storm has separated into four distinct bands, and the predicted total has gone to 2" instead of 1". So I guess we really WILL get some rain this time, and I take back my comment about the rain goddess. So, ahem - speaking of rain ... after an insane delay of 2 years with city permitting (never buy a historic house, and if you think it's going to hit the 90 - 100 year mark while you're still in it, pass it by!) ... I FINALLY got the new roof completed just last week. I was pretty nervous because all the long term predictions were that the 'powerful' el Nino was going to start at the end of November. So, let me just ask rhetorically - and WHAT month and YEAR is it NOW??! I just couldn't imagine what a nightmare it was going to be with it raining and the entire roof off. Though we desperately need the rain and I was disappointed at the lack thereof, I was at the same relieved. I had very mixed feelings. But now I can say - let it rain, you rain spirits!! Do your best to help us out! 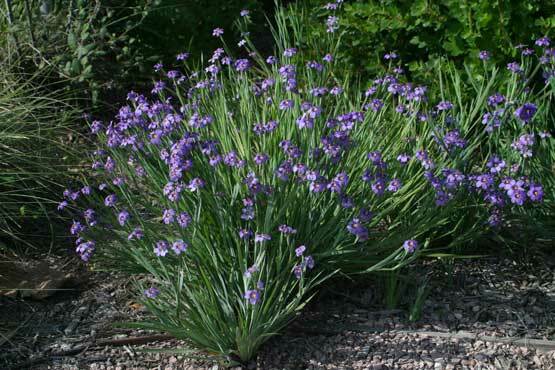 As for allergies - generally the flowering plants aren't an allergy problem. They have flowers to attract the pollinators because their pollen it too heavy to travel on the wind. OTOH grasses and many trees are wind-pollinated. 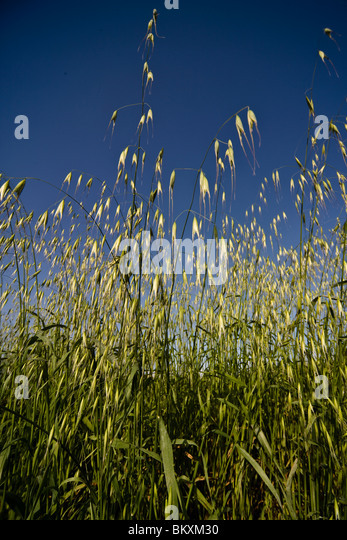 So I suspect that an allergy that comes at the same time as a particular bloom is some unnoticed grass or tree (or mold) doing its thing. I had allergy testing done to the most common allergens here (about 25 of them), foods, and some specific additional ones - like mouse and horse. If you live in an area with mice, you should get tested though it's not a common test, also, if you live within a mile of horses get tested for horse allergies, as I was told the dander's extremely 'sticky' and doesn't wash or blow away easily. And it turned out I was very allergic to some molds and somewhat allergic to everything else that's airborne (except two plants), and also some foods. I did do allergy shots for many years and avoided those foods I'm allergic to, which helped somewhat - at least I don't itch everywhere all the time. But I think I need to go back because I still have a hard time breathing when it's humid. So some allergies may have strengthened again, or I'm allergic to some uncommon allergens that weren't tested for. That's been my experience with allergies, and some of what I learned in the meantime. Other things I learned are that Yews - planted everywhere for their landscape value, are slow growers that only start blooming after many decades, but once they do, they can cause severe allergic reactions. All parts of a yew plant are toxic to humans with the exception of the yew berries (however, their seeds are toxic); additionally, male and monoecious yews in this genus release cytotoxic pollen, which can cause headaches, lethargy, aching joints, itching, and skin rashes; it is also a trigger for asthma. These pollen granules are extremely small, and can easily pass through window screens. Male yews bloom and release abundant amounts of pollen in the spring; completely female yews only trap pollen while producing none. Yews in this genus are primarily separate-sexed, and males are extremely allergenic, with an OPALS allergy scale rating of 10 out of 10. 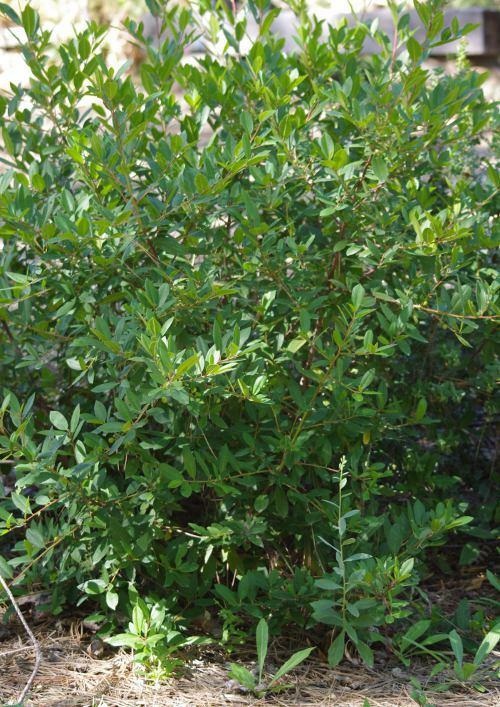 Completely female yews have an OPALS rating of 1, and are considered "allergy-fighting". Congrats on the new roof! Let it rain, let it rain, let it rain! I myself got new wiper blades last night. I haven't needed them for ... a long time! According to LADWP (Los Angeles Dept Water & Power) most rain gages recorded somewhere between 2" and 5" of rain in the last 72 hours. I'd say that those were two good storms. Since that eliminated the deficit from OCT/NOV/DEC, all we need is about 10 more of those and we'll be right at average! I hate to complain about lack of rain nearly every time I post, but we just had (yet another) blow-by rainstorm from this El Nino, that was supposed to be the biggest on record. Yeah, this storm huffed, and this storm puffed, and from three to one days away it was predicted to bring somewhere between 0.75" and 1" of rain. Which would have just brought us up to average, you realize. And then it did what most storms have done so far this year: Speed up and evaporate. I think we got maybe 0.1" out of it. This El Nino, so far, is a bust. Out of something like 5 predicted blow-bys and five predicted direct hits, we get two real storms of about 1" each, and only a couple of other 0.1" rainfalls to nothing at all. Lady Rain- such a tease. "The elephant labored and brought forth a mouse". It would take a miracle parade of storms in February and March to just keep So Cal at average, much less reduce the water deficit. OK, I'll stop complaining now. I just had to get that off my chest. 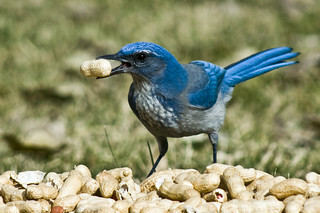 Late to the topic, but that scrub jay with the peanuts is having the best day of their life. Oh damn! Here it is, too late today to do anything about the rain! I just thought - maybe I could wash the car. I heard and excellent idea- instead of building an oil pipeline from Canada to the USA, how about a WATER pipeline? Imagine, the person who told me this said, what a kind of "damage" a pipeline leak would create: GREEN GROWING PLANTS. Oh, don't believe that groundhog, BRENDA! Wind generally isn't a factor in LA. Rain isn't either, apparently! So you can have my umbrellas, BRENDA. Just tell me where to ship them. Yep, that El Nino ... it's still there, but hasn't produced any rain for us. I keep hearing on NPR "We need your el Nino stories.." and I'm like ... WTF??? What El Nino"? Not only are we way behind on rain, even with the so-called biggest El Nino on record happening, do you have ANY IDEA what the temperature has been like around here??? This isn't "like summer", this is like a summer heat wave. So, my El Nino story is that I'm watering more now than I was in summer, because this is the season for CA plants to grow. Can we have that water pipeline from BC now, BRENDA? It's a good thing I had most of my lawn ripped out! On a happier note, I mentioned that I made a certified backyard wildlife habitat. I have all of the things in place for little critters to thrive: water, shelter, and food. Most of the natives that I planted are in deference to the small creatures that we share the earth with- flowers for the bees and hummingbirds and butterflies; berries for the birds, possums, etc. ; and mulch which seems to keep a healthy population of bugs and grubs and lizards and raccoons going; avocados which the squirrels seem to enjoy, as well as hummingbird feeders. Over the past few years, I've seen more and more unusual birds stopping by for a drink or food. So aside from the usual crows, English sparrows, mockingbirds, and Allen's hummingbirds, I've seen Orioles feeding from the hummingbird feeders, black Phoebes and yellow warblers picking bugs from the ground, mourning doves eating the seed I throw out from time to time, bluebirds (real honest-to-gosh bluebirds! ), a scrub jay, and yesterday a Northern flicker drinking from the birdbath. I'm just as excited as all get out! As my plants grow and start to bear fruit, I expect I'll see more and more birds stopping by. On top of that, my fuschia-flowering gooseberry set off a bunch of blooms this year, and my pink flowering currant is going to bloom for the first time too. I wait in happy anticipation! Sad to say. I'm watering my trees in February. Last year even though it was dry, I skipped the water, and the trees were late to leaf out, with a far smaller number of, and smaller, leaves and flowers. (Though the flowers that they had were unusually bright.) So what I learned was that even though not much appears to be happening at this time of year, the plants - even the ones that appear dormant - are laying down the cells for growth. I intend to help them along this time. The other thing I noticed was that last year seemed to be a great year for wild oats, but not the other wild annual grasses (especially not the wild barley, which I loathe, because it catches in fur and works its way under the skin of many unfortunate animals - due to its sharp tip and barbs) . Though there wasn't a lot of rain last year as well, it was just the right combination of cold and wet, I surmise, at the right time, for the oats. This year, not so much. I think there was not enough rain and cold at the same time. 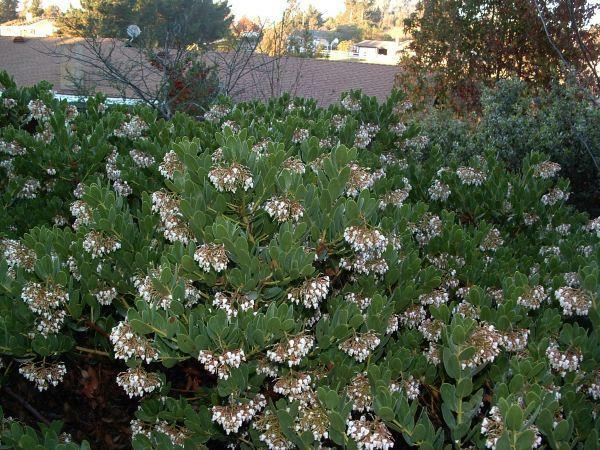 The little brown birds are secretively nesting again in the Catalina Island Cherry hedge. And, once again, I'm hoping for a Great Northern Owl pair to nest in the Incense Cedar. It only happens rarely but it does happen! C'mon guys - there's plenty of mice! I have a lot of birds nesting in my yard during the year, but then they go make their living on the wild hill across the street, and probably elsewhere. I like to see their little comings and goings as they bustle about and raise their families. I'm glad they have the all those spots that suit them. A wild hill across the street- lucky you! Any coyotes? If so, care to share? I have a few too many feral cats around. I DID see a coyote, once, but I guess it doesn't like a diet of feral cats because it didn't stick around! Good thing, then, that I'm still watering that parking-lot tree, four gallons at a time. Coyotes - yes. I WISH I could share them! And many years ago a bobcat. I hope there're still some around, but they're secretive things. You don't often see them. I'm glad you're watering the tree too! I imagine a happy tree, going 'aaahhhhhh...' in tree-speak. 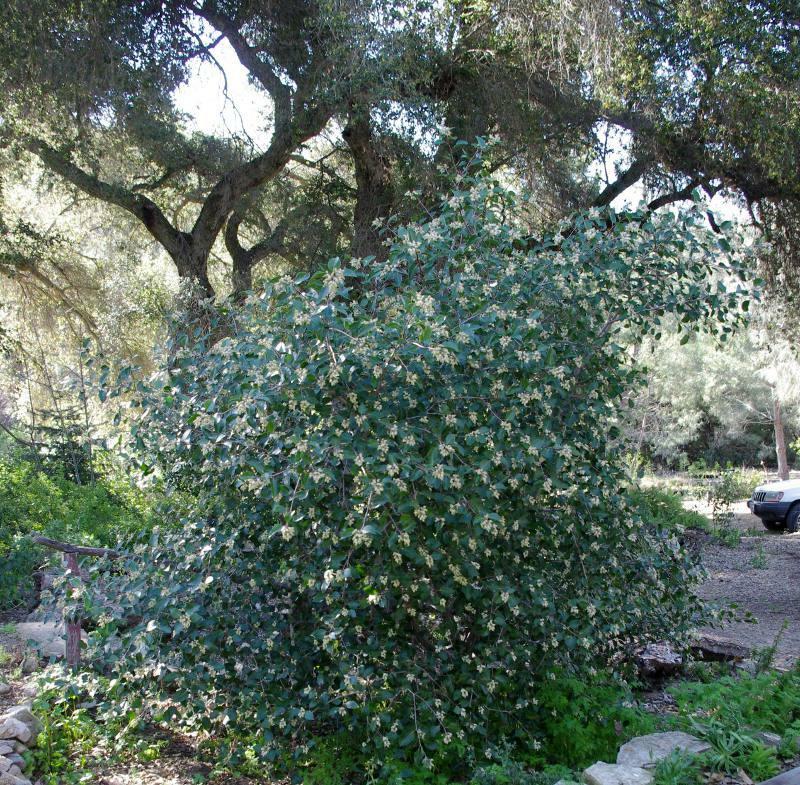 I think my love of CA native plants and naturalistic designs comes from my childhood of running wild thru the fields near our house, altho that was 55 years and 3,000 miles away. So altho we are terribly behind in rain this year, again, at least we got a bit of a reprieve. The plants are happier now, the fungi ans bacteria, the bugs, earthworms, grubs, lizards, mice, rabbits, gophers and other small creatures will be happy too, as the plants respond to the rain. So will the hawks and coyotes and bobcats. The land here is smiling. We have been blessed. The forecast is for more hot weather afterwards for about ten days. We're going to need a whole season's worth of rain in March if we're going to catch up to even average. It's happened before, but to give you an idea of how rare that is, that single event has a specific name: Miracle March, and it happened in 1991. I'm particularly vexed about the weather because I had planted a bunch of seeds: cosmos, bachelor buttons, mixed-color CA poppies, lupines, wild oats, and purple three-awn, right before the weather turned ridiculous, and as of now only a few lupines started coming up. 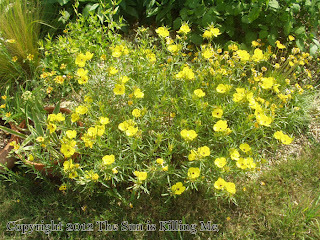 The CA poppies need to be sown in place- they can't be transplanted. But I ordered more seeds, and I have a bunch of used styrofoam cups and potting mix/ garden dirt ready, and I'm going to start seeds indoors- to hell with the weather. In addition to a regular birdbath, I have a large water-filled 2 1/2 foot blue ceramic tray .... the kind of thing you might put under a very large houseplant ... on the ground for the little animals. As I recover from surgery, I get a chance to see the backyard doings. Three days ago I was none too please to see a feral cat drinking from the tray, but two days ago a squirrel came for much-needed water. So it prolly serves the night-time community as well. Onward with the gardening! Happy with the rain. In addition to a water pipeline from BC to CA, I propose an air pipeline! That away, we can send you our hot air and you can send us some water! 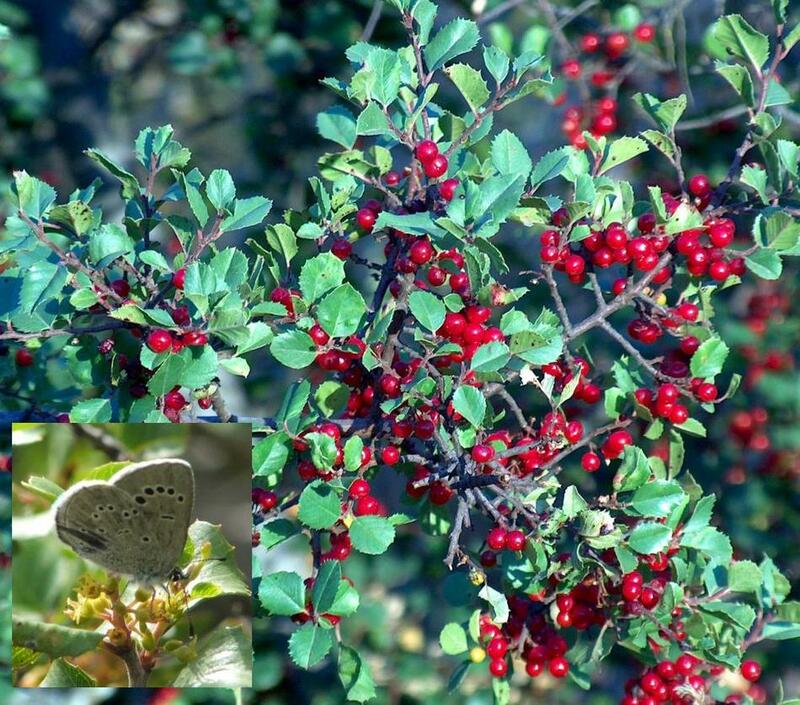 will be a couple of bushes of the ever-elusive hollyleaf redberry (rhamnus crocea ilicifolia), which I've been looking for since more than a year ago. Finally found a source last week. If it's happy, it will reward you with lots of tasty berries, assuming that you can get to the before the birds do. Most of my plants were chosen from CA natives to be water-wise, pretty, and have some value to birds, hummingbirds, pollinators, moths, and butterflies. Altho I have three hummingbird feeders up, they haven't been visited lately - I guess because there are many more flowers in bloom now. And just as I was pleased to see animals drinking from the large dish of water on the ground, I saw a hummingbird busily working the red autumn sage (salvia greggii) which- contrary to its name, is just beginning to bloom in spring. The hummer was completely ignoring the feeder not ten feet away! Other flowers blooming now are the pink flowering currant, sundancer daisy, and monkeyflower. In the forecast: One inch of rain, starting Sunday. Uh huh. I'll believe it when I see it. So many storms have approached us ... It's coming! It's going to be HUGE! Get ready! ... only to see the storm front peak and then evaporate away. So while I have my fingers crossed, I guess I'm not going to get too excited about it. For whatever reason the website's always been pretty lackadaisical about getting data up. If this last storm dropped an inch of rain we're still 3 inches behind. At this time of year it's a 25% shortfall. I set out a little straight-side plastic container, it looks like we got about 0.5". Not the whopping storm that was predicted, but better than nothing. At least we're only a couple of inches below average, not six inches, like last year. I predict there will be a nice annual flower show, except for lupines as they seem to need a lot more water. So, I got my water bill, and they show what you've been doing for the past year and how it compares to the year before. OK, granted that in that two-month billing period we had a couple of storms that let me turn off the irrigation for two weeks, but I also watered once a day for a WEEK to try to give my seeds a running start. (It didn't, I just couldn't overcome the record-setting hot, dry weather.) So given all the pluses and minuses of the last billing period, and comparing the highest bill of the previous year to the lowest bill of this year, which was the most recent, I dropped from 45 CCF to about 7 CCF (centicubic feet). Today we got into a spurious Spring Cleaning. It started with the new computer .... but the desk needed cleaning, and the wall and floor. And really underneath the printer stand, and how about taking out the old printer and putting in the new one? And getting rid of some of those tangled wires? And the sofa really needs vacuuming, the sofa-blanket needs washing, and what about that crap that's been collecting dust in the other corner and ...??? WHEW! None of the stuff that I usually do on Sunday got done, and a "15-minute" job turned into an entire afternoon. But we all accomplished a lot. Another late storm adding about 0.3" to the total. The last couple of storms coaxed the wild oats to grow. Yeah, unfortunately someone helpfully weeded them for me! RECIPE FOR CHICKEN TAGINE MOVED TO PROCESSED FOOD IS KILLING US thread. That last rain was the last rain for us, this rainy season. Not even at normal, but given how sparse the rains have been for the last three years the oak trees were signaled to bloom, and they're blooming like I've never seen them bloom before. No wonder the hummingbirds (and bees) are ignoring the feeders! But they'll be back in summer, when nothing is blooming! The Dara's Choice salvia - apparently a very early bloomer- is done, but the bees had a field day with them! Walking the garden with my gardener, a mourning dove burst out from under the Cleveland sage and a fledgling toddled out as fast as it could after her. Family and helper were stressed by the apparent abandonment of an "injured" fledgling, but I know that fledglings stay on the ground for at least a couple of days and that mom and dad might be back, given space. I tossed some seed out to induce the adults to come back, and saw two adults and heard cooing on the ground that day, and kept tossing seed out. Was gratified to hear that dear daughter saw both adults and fledging on a nearby roof- apparently the baby mourning dove survived its perilous time on the ground and is now flying. Yay birdee! The front garden is is looking better and better as the plants grow and fill in and the penstemons are attracting hummingbirds while the fancy-colored CA poppies are attracting native sweat bees. But the backyard is where all the action is! Last weekend I refilled the hummingbird feeders - finally- and made sure the birdbaths were filled, and this weekend I tossed out some birdseed and peanuts and not only did the usual mourning doves show up but this time I had a small flock of happy English sparrows (their population had been decimated by West Nile), two female and one male hooded Oriole dicing with the hummingbirds for the sugar water and splashing in the birdbath, of course a lot of Allen's hummingbirds, and a couple of jet-black starlings with their bright yellow beaks. And a poor squirrel with a third of its tail missing. Over the past several weeks I've seen crows hunting fence lizards in the yard (their population was also decimated) stalking the garden carefully, so I started putting out some meat scraps and sure enough, the scraps reliably disappeared. I assume the crows were feeding their young. This is in a very suburban neighborhood, where everyone's lawns are mowed and all of the hedges are shaped into poodle-shapes, so not only is my turf-less CA native front yard a poke in the eye to all of the uptight neighbors, it's a refuge for small animals. Yesterday has a sparrow hawk wandering around underneath the hedge eating a baby magpie. Nature can be harsh. 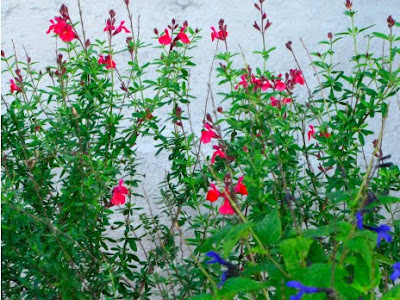 I have lots of salvia in my garden too- pineapple sage flowers bright red and you can make tea out of it as well. When I feed the crows, I know that there will be more crows next year, eating more lizards. Feeding the hummingbirds just means that there will be more hummingbirds straining after the same resources next year. So whatever I put out isn't really a permanent favor, animals will breed to the capacity of their environment and there will still be animals dying at the margin between "just enough" and "not enough". But people are smart, and we know to respect the limits of our environment, right?